I am almost done with this phase of discretionary trading... but not yet. Another loss day. Frustration. But not as bad as Monday. A single win can change the day's mood. The missed move: It opened in yesterday's range. I was ready to go long as the price approached 8100, but did not take the trade waiting for a better setup. Trade 1: My bias was long, but I took the short trade with the hope that price would fall back into range and then do better. 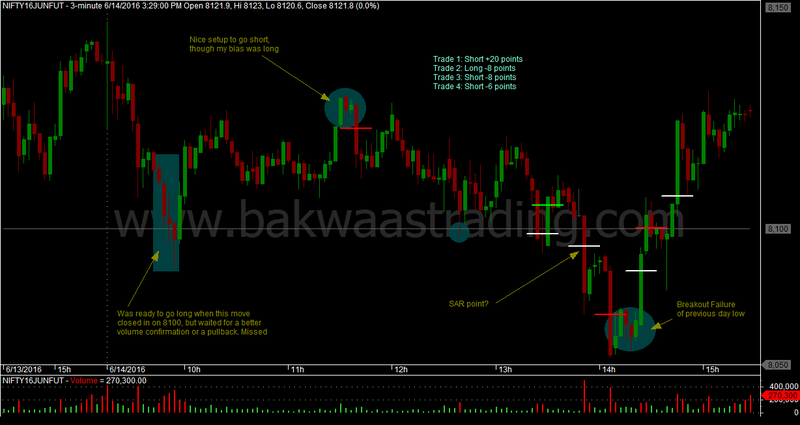 It did, and I was able to exit for a profit, but only because I ignored move in my trading time frame. The move was smoother in higher time frame, but was jerky in my trading time frame. And there was more steam in that move after my exit. Trade 2: I thought that this was a good breakout failure, but lost. Did not attempt trailing stop. The exit could have been a reversal point, but I ignored. Trade 3: Hoping for a crash (with momentum), since the trend is down, but it turned into a Breakout Failure of Previous Day's Low. Trade 4: Attempted an early Breakout Failure of 8100. Failed. Stopped trading for the day.